Bankhead is the second brewing operation to take up residence in Rowlett (© Brian Brown/Beer In Big D). Bringing forth the first brewpub in the city, Bankhead Brewing Co. is now open in Downtown Rowlett. Ryan Pyle and Kevin Lefere are partners in the venture, which gets its name from an early cross-country roadway that had a stretch that ran through Downtown Rowlett. The Bankhead Highway, as it was known, was conceived in 1916 with the goal of connecting east-to-west with endpoints in San Diego, California, and Washington, D.C. It reached Rowlett in 1921, over 30 years before the city itself was incorporated in 1952. As for Bankhead, the brewpub, it sits in the shadow of a historic water tower on Main Street. 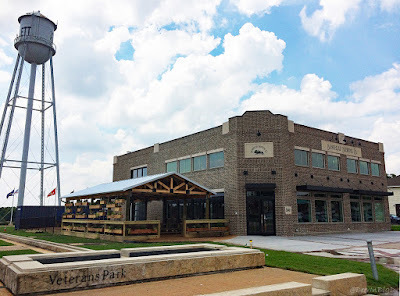 It's also mere minutes from the city's downtown Dart station which, along with developments like the Village of Rowlett, makes it part of a long-term revitalization effort that seeks to reshape the city center into a "vibrant, transit-oriented district where citizens and visitors work, play and live." The brewpub is located adjacent to Rowlett's Historic Water Tower (© Brian Brown/Beer In Big D). 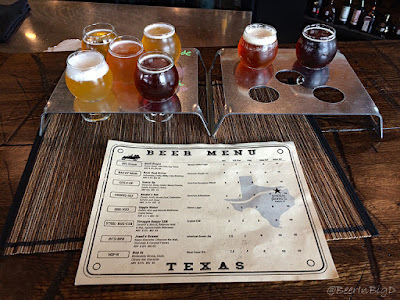 History and Bankhead's place in Rowlett's master plan aside, though, what's likely most important to readers of this blog is what the brewpub has to offer when it comes to beer. On that note, anyone looking to try a flight, half-pint or even a pint should go in expecting beers that are crafted by the book and brewed to style. And, let's not forget malty. A west-coast IPA is still to come, but other than a hoppy brown, the bulk of Bankhead's current offerings are malt-forward, though an ESB does feature what the brewpub accurately describes as an "approachable bitterness." Sometimes one taster tray just isn't enough (© Brian Brown/Beer In Big D). In fact, all of Bankhead's beers are right on the money when compared against tasting notes provided on the everyday menu. Still, for those that have yet to make the trip to the area's newest brewing operation, here's a rundown of the brewpub's lineup. The work of both Pyle and brewer Chad Moshier, what you'll find are beers of American, English and German origin with names that reference automobiles and alcohol. Devil Wagon - Munich Helles Lager (4.4% ABV, 20 IBU): Some called automobiles devil wagons in the early 1900s, so the name of this beer fits in well with Bankhead's 1920s rustic-style atmosphere. As for the beer, it's a lightly sweet easy drinker, with grainy undertones and a dry finish. Back Seat Driver - American Blonde Ale (4.8% ABV, 25 IBU): While few would argue that back seat drivers can be annoying, this light and refreshing blond ale couldn't have been more pleasant. It's malty with maybe a hint of fruit and almost no bitterness on the back end. Gussy Up - American Raspberry Wheat (5.0% ABV, 19 IBU): Appropriately named, since it was the only somewhat fanciful offering on the board, this beer's subtle fruit infusion paired well with its grainy wheat base flavor. Hoofer's Hef - Bavarian Hefeweizen (5.3% ABV, 12 IBU): A straight-forward hefeweizen, Hoofer's hits on the expected notes of banana and clove that are typical of the style. Giggle Water - Vienna Lager (4.4% ABV, 20 IBU): With its clean feel and tasty toasted malt flavors, this was probably my favorite beer on the board. It's also low in strength, which means there's probably not enough "giggle water" (i.e. alcohol) in this beer to make you giggle much after a single pint. Struggle Buggy - English ESB (6.5% ABV, 43 IBU): According to Google, the phrase "struggle buggy" has origins in the 1920s and has something to do with getting rambunctious in a car's rumble seat. Be that as it may, drinking the beer is far from a struggle based on the aforementioned approachable bitterness. Janet's Brown - American Brown Ale (6.8% ABV, IBU): I'm not sure who Janet is, but whoever she is...she must like hops. That said, this is a brown ale that shows its American influence by way of the hoppy character, which tips the balance a bit away from the mostly caramel malt backbone.